Push your practice further with a ball designed exclusively to help build setter strength and skill. 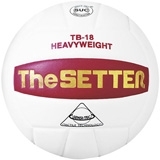 The Tachikara TB18 Setter Ball is a weighted, practice volleyball vital in your training arsenal. Regulation size and made with composite leather, the extra weight of this ball builds strength and build serious setting skills.